WASHINGTON (CN) – An 18th century philosophe made an appearance at the Supreme Court on Monday for a challenge to how the Securities and Exchange Commission installs judges. Gibson Dunn attorney Mark Perry made the reference this morning while enumerating the powers of the SEC’s administrative law judges. Contrasting these officers against typical agency employees, Perry noted that they can develop a record in enforcement actions, conduct trials and make rulings that become final if the SEC declines to review them. 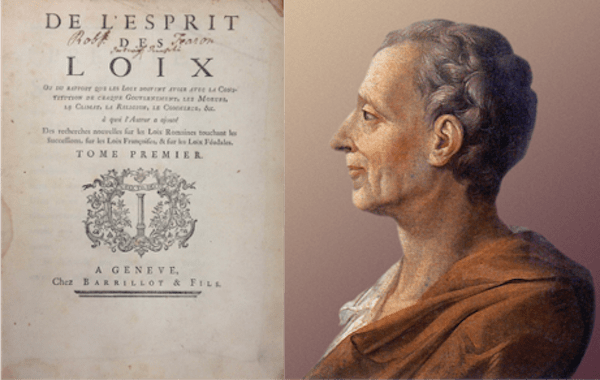 Montesquieu is credited with articulating the separation-of-powers theory, which laid the foundation for the appointments clause of the U.S. Constitution, among numerous other legal frameworks. The appointments clause requires that the president, courts or department heads appoint inferior officers of the United States, and Perry told the Supreme Court that this principle is trampled by the SEC’s custom of having administrative law judges take office on appointment from the agency’s chief judge. Perry’s client, Raymond Lucia, challenged the scheme after an SEC administrative law judge banned him for life from working as an investment adviser. Because the SEC declined to review Lucia’s punishment, the judge’s decision became the agency’s final action. Among those supporting Lucia’s challenge is the United States, putting Deputy Solicitor General Jeffrey Wall in the unusual position Monday of siding with a person challenging a federal agency. Echoing Perry’s argument, Wall relied heavily on the 1991 decision in Freytag v. Commissioner, which found special judges for the U.S. Tax court were inferior officers under the Constitution. But some of the justices focused meanwhile on the intent of the Framers to insulate SEC judges from the political process. With the government on Lucia’s side, the court appointed O’Melveny & Meyers partner Anton Metlitsky to defend the current regime Monday as amicus curiae. But the justices struggled to find who would qualify as an officer under Metlitsky’s proposal. Chief Justice John Roberts honed in on this issue of accountability as well. Justice Stephen Breyer voiced concern meanwhile that subjecting administrative law judges to the political process by defining them as officers would be the effective end of a merit-based civil service in the federal government. “I don’t know that anyone in this case has methodically gone through civil service positions to tell me whether or not, if we decide one way or the other and on the theory, we are driving wedges of dependence into what was to be since Chester Alan Arthur, a merit-based civil service,” Breyer said.